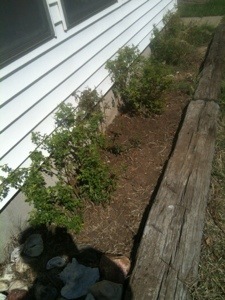 My grandmother had these mini rosebushes planted a long time ago. They have pretty much suffered from years of neglect. There was/is grass and weeds growing up all throughout the bed. The closest thing to mulch that I think was ever used was sand. Ick. 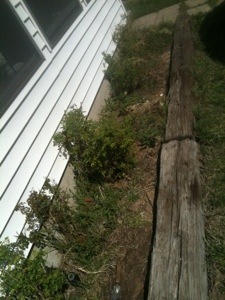 I pruned the first three bushes after I tried to dig up all the grass and pull out the weeds. It does look a lot better now, though I’m only half done with the bed. I did some research just now on how to keep it from coming back. Evidently you need to cover it with 1/2 inch of newspaper and then some shredded wood mulch. I’m not sure that that’s a luxury we can afford right now, so I suppose I’ll have to either figure out an alternative wood mulch or just keep picking the grass next year until we can afford it. 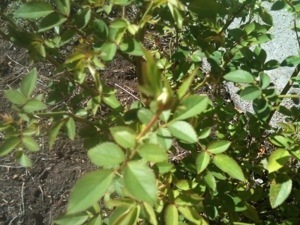 One of the rosebushes has a bud on it. Pretty. This is the end of the project today. Not too bad.